In a medium bowl, cream butter with sugar. Add eggs one at a time and mix well. In a separate bowl, mix the dry ingredients. Add dry mix and cream to the butter mixture. Mix quickly until you have a smooth batter. 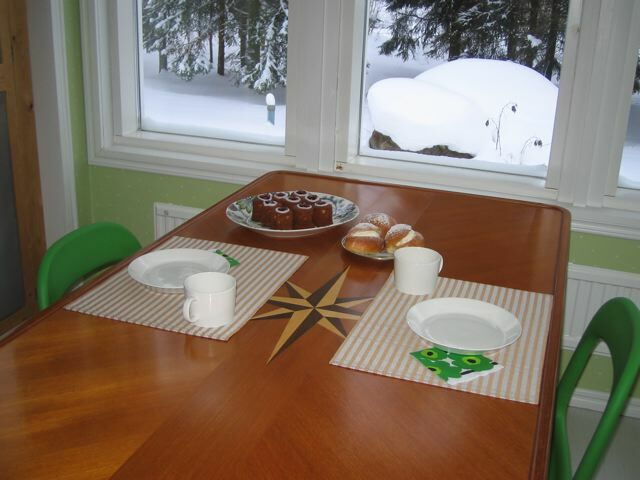 Pour batter into prepared muffin tin, filling the cups only to 2/3 (in Finland, special tall cylinder-shaped forms are used). 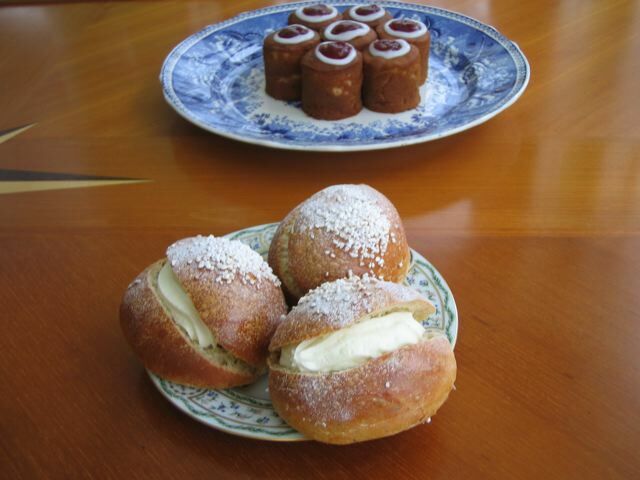 Create indentions in the middle of each cake: dip your thumb into flour and create a small divot in each cake. Fill the indention with jam. 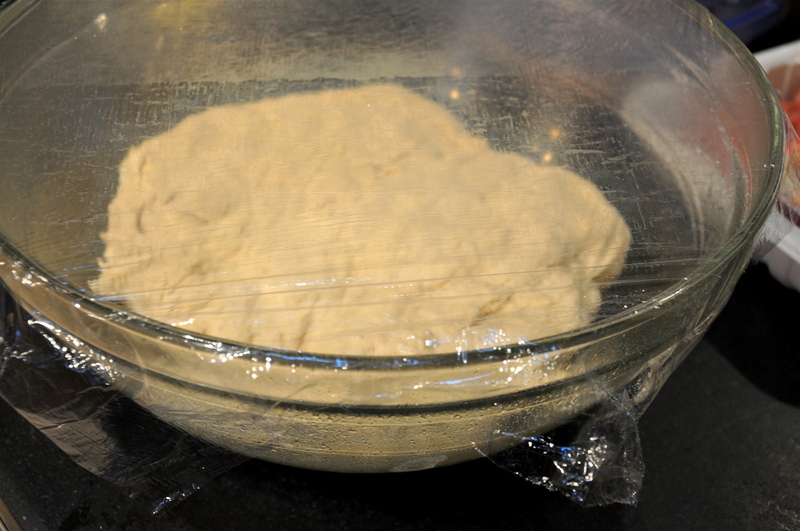 Bake in preheated oven for approximately 15 minutes. When the cakes have cooled, decorate. Mix the confectioner’s sugar with water until it becomes a thick paste. 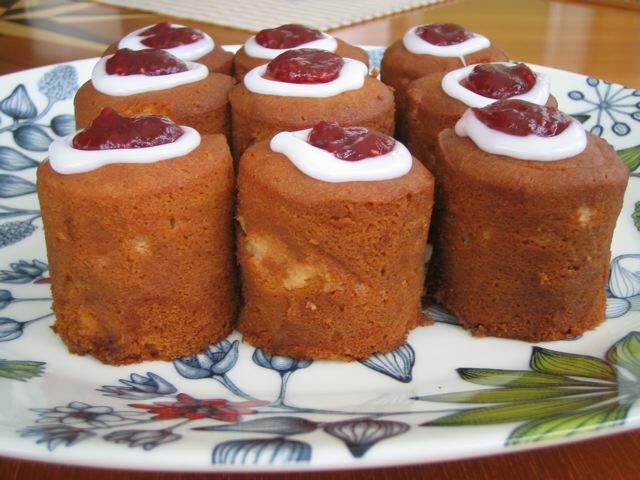 Pour or pipe a ring around the jam indention in each cake. “Top up” the raspberry jam as desired. If you prefer a drier cake, then you are done. If not, dip the cakes quickly into a small amount of almond extract mixed with water and sugar. 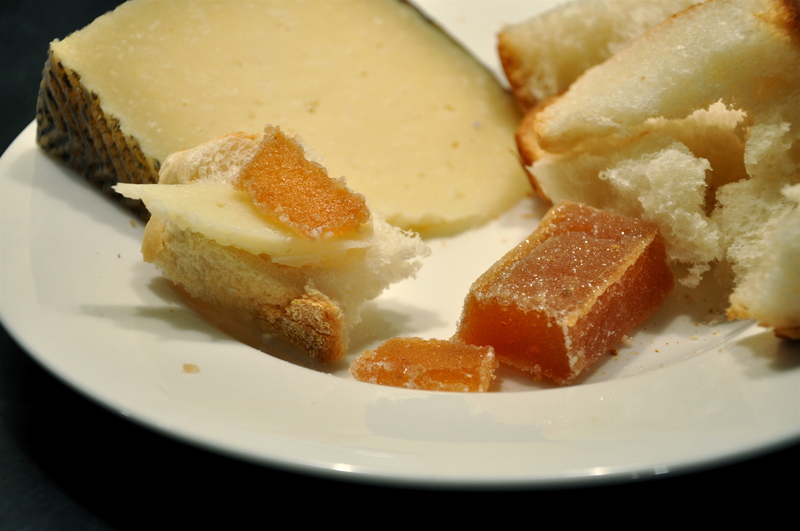 Manchego is a dry, firm sheep’s milk cheese. It has a sharp initial taste with a nutty, earthy finish. 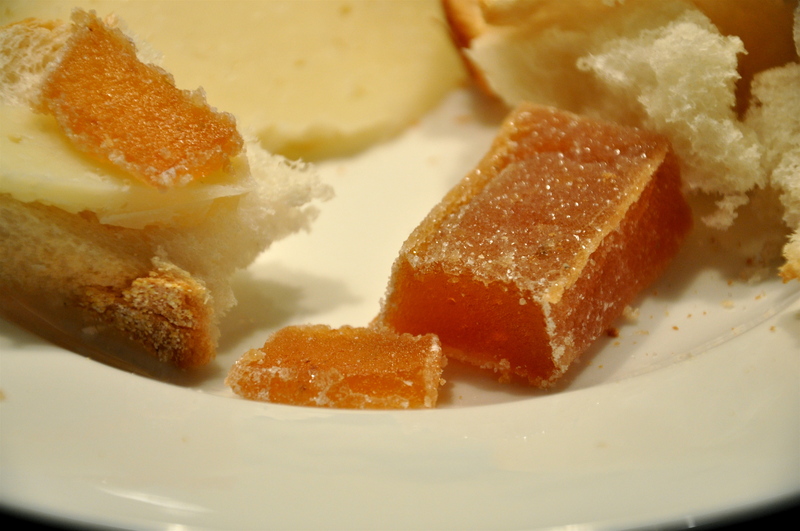 And the quince paste added a mellow sweetness that was perfect with the audacity of the cheese. I loved them both. If you can find a wheel of this cheese so the slice is fresh, it would make an easy, elegant and exceptionally delicious appetizer plate. I am a visual person, so when I saw this recipe on A Yankee in a Southern Kitchen’s blog, it was only a matter of time before I made it. Bread has always been my downfall. Even chocolate, although a powerful temptation, is no match for bread. I can be satisfied with a couple of squares of good chocolate, but one slice of warm crusty bread? No way. I need at least two. With butter. Or salted olive oil. Homemade bread is intimidating. 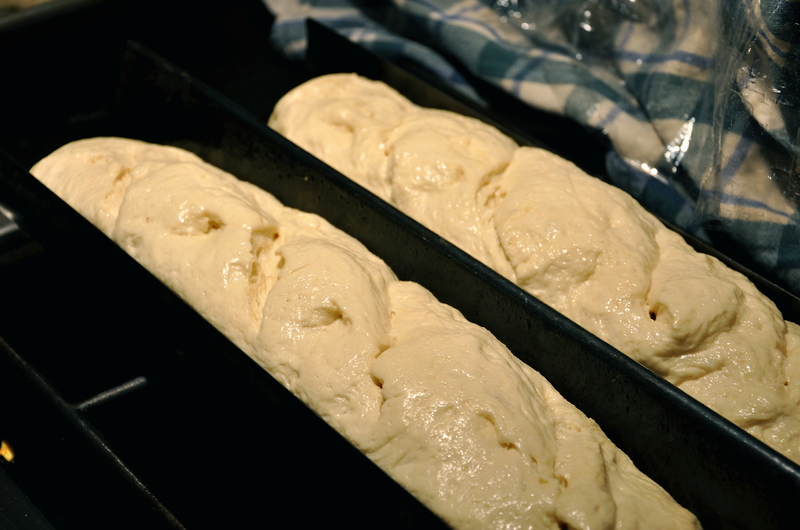 Something about letting it rise three times eliminates probably 95% of the would-be chef pool. Who has time to wait that long? Apparently I did. A couple of weeks ago, my child was home for 6 days with the flu (supposedly the dreaded H1N1) and strep, so what else is there to do but bake? I cannot tell you how good our house smelled that week. And clean. We scrubbed every surface, and it must have worked because only one went down (so far). 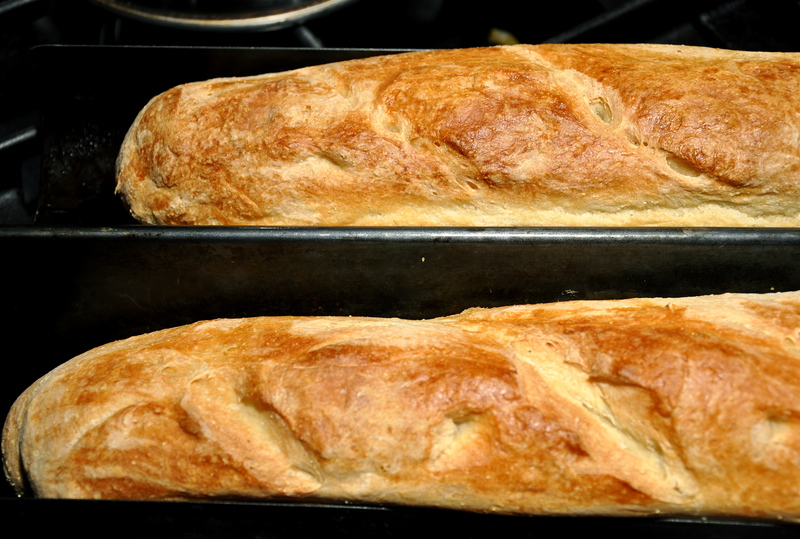 This recipe is not for a French baguette, that crunchy, chewy, crusty loaf that has a yeast flavor with the airy interior texture. This is a heavy, solid, evenly textured bread. 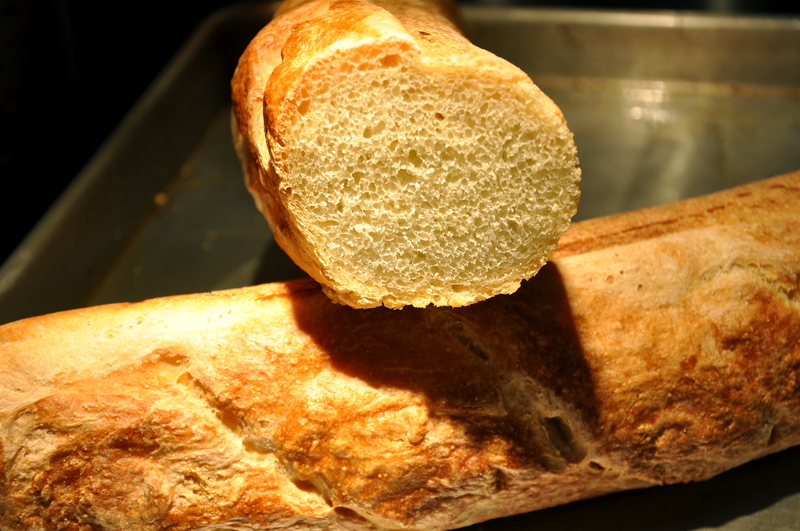 It has a wonderful substantial crust and retains that delectable yeast flavor. I made two loaves and several rolls from this one recipe. 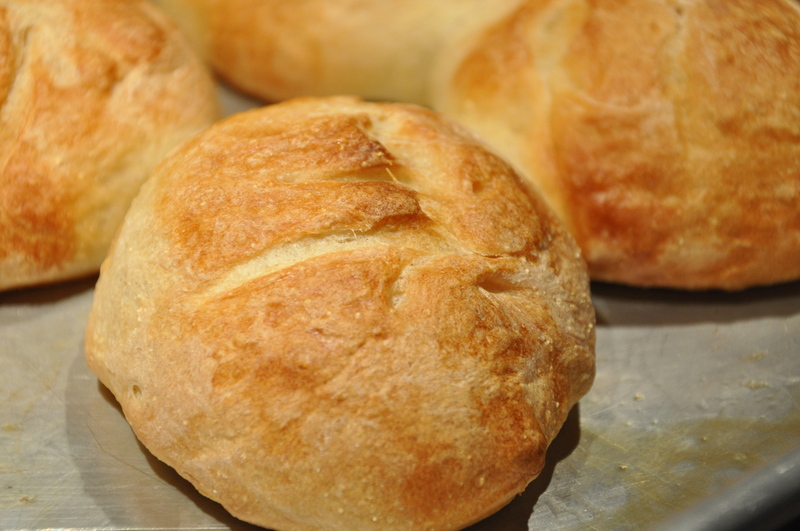 We used the rolls for sandwiches over the next few days and devoured the loaves almost immediately. Everything tastes better on a fresh loaf of bread. Especially butter. Salted butter. 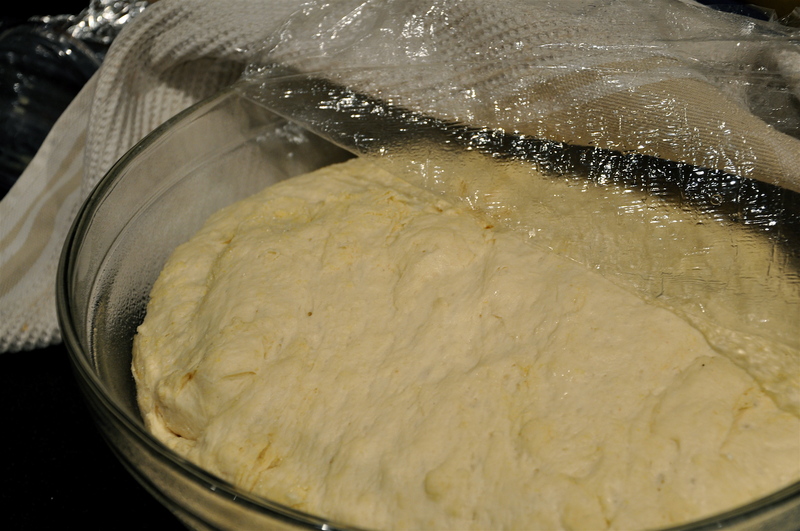 Dough after the first rising. Finally. It was worth the wait. When it snowed a couple of weeks ago, I started looking at real estate in Florida and California. Online, of course. But as the snow melted and temperatures warmed, we witnessed that beautiful time of year when the trees put on one last display before they’re snowed under. So between the snow and rain storms, we took to the great outdoors for some work (raking) and some play. In addition to the colors, a New England Fall wouldn’t be the same without visiting the orchard and tasting real pressed cider and apple cider doughnuts. (This isn’t the exact recipe but it looks pretty close. I won’t be making these because I don’t own or even want a Fry Daddy. And because I can go down the street and buy them without risking my life near a vat of hot oil.) These were the best doughnuts EVER (and we’ve had a lot of doughnuts over the years) because they were still warm when we bought them. Mmmmm. And if you think we went apple picking, you would be wrong. We went to the orchard, took the photos, and bought the doughnuts and apples in the orchard shop. I know that’s lame, but when the kids look back on these photos, they’ll think they went apple picking. And we usually do the picking, but we had just raked leaves for two hours (another reason I was fantasizing about palm trees), and all we really wanted was the doughnuts. The apples above, from left to right, are Mutsu (my favorite), Jonagold, and Granny Smith. What the heck is a torta? That was my question when I saw these several months ago at my local grocer. Finally, they went on sale, so I found out. I have been eyeing these babies for months in the deli section. I always wondered, “Who buys those, and what are they for?” It’s hard to describe these tortas—they are more robust that a cracker but not as substantial as a pita. They come in savory and sweet varieties. What captured my attention was the use of olive oil. I adore the flavor of olive oil and drizzle it on soups, breads, salads, and pastas. So these tortas intrigued me. Pictured above is the Sesame & Sea Salt variety. Anything with visible crystals of salt makes me drool. I had some Cambozola cheese on hand (thanks to my mom-in-law for introducing us), which turned out the be a perfect pairing. The crunchy saltiness of the torta with the creamy bleu of the cheese was a rich flavor. Below are the sweet tortas. I tend to like the salty better, but the sweet is tasty with a cup of tea. (Frankly, when I crave something sweet, only chocolate will do. I didn’t see any chocolate-dipped tortas.) With the slight flavor of anise seed, these are sure to please those who don’t have an overactive sweet tooth. I am pleased to have unwrapped this mysterious treat. I would buy both flavors again, especially if having guests over. The savory crisps would go well with any number of toppings, and the sweet tortas could be broken and the pieces served with ice cream and coffee. Here is the very creative website: Ines Rosales. I inadvertently left some of the “crunch” out of these delicious muffins. As the muffins baked, I was cleaning up the counters and saw the chopped walnuts that I had taken out of the freezer but never added to the batter. I really love walnuts. I thought about cramming some by hand into the half-baked muffins, but it wasn’t worth the burns. Then I imagined using a toothpick to kind of poke the nuts into the center of the muffins, but all I had were colored toothpicks (don’t ever buy these, for so many reasons, but the main one being they bleed into everything, especially white frosting) and I could just picture colored holes speckling the tops. 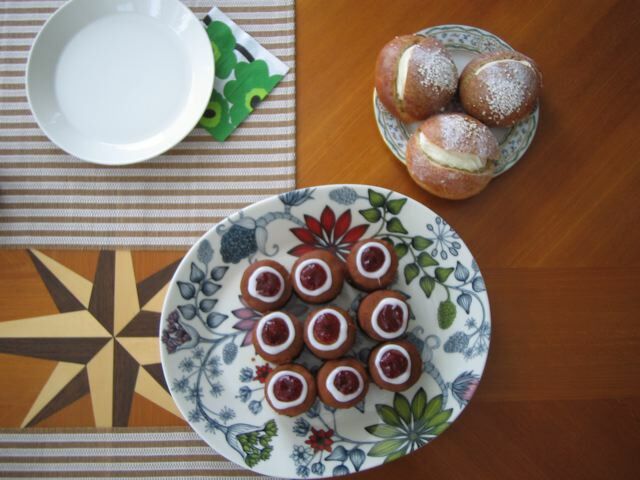 So I served these semi-crunchy muffins to my arriving friends, apologizing for my forgetfulness. But as my friends and the empty muffin tins told me, it didn’t matter much. These little baked treasures have a permanent spot in my recipe box. And it’s not even because of the crunchy topping; it’s the coconut. Every person (including the little foodies) said with delighted surprise, “Is there coconut in this?” Oh, yes. Coconut and banana. There are two tips for this recipe: definitely use paper or foil liners so the warm muffins come out in one piece; use a pastry blender to mash the bananas. For more tips, click over to Work-For-Me-Wednesday at We Are THAT Family. Line 18 large muffin cups with paper liners. Sift the flour, sugar, baking powder, baking soda, and salt into the bowl of an electric mixer fitted with a paddle attachment. Add the melted butter and blend. Combine the eggs, milk, vanilla, and mashed bananas, and add them to the flour-and-butter mixture. Scrape the bowl and blend well. Don’t overmix. Fold the diced bananas, walnuts, granola, and coconut into the batter. Top each muffin with dried banana chips, granola, or coconut, if desired. Bake for 25 to 30 minutes, or until the tops are brown and a toothpick comes out clean. Cool slightly, remove from the pan, and serve.